This post is sponsored by Line Knitwear. Every woman knows just how hectic life can be and sometimes your personal style can fall through the cracks along the way while you are working and running around playing “Super” mom. Why not take some fashion advice from a few sensible and stylish celebrities and wear outfits that easily transition from work to play? Hilary Duff, Mila Kunis and Bridgit Mendler want clothing that is both simple and luxurious. The Quantum Sweater at www.MadisonLosAngeles.com, made by Line Knitwear, does just the trick, updating your wardrobe and keeping you in style. This sweater is soft, light and comfortable. It’s so fashionable that not even a necklace or bracelet is needed to accessorize it. What’s really great is that this color-blocking top also changes with the seasons taking you from spring to summer and even into fall! Just like Duff, you can wear it over a swimsuit as a cover-up for a day at the beach. Or you can wear it over a camisole with your favorite jeans while hanging with your girlfriends. Even the sweater by itself, paired with a hot skirt and killer heels, will leave you looking great for your mate on your next dinner date. 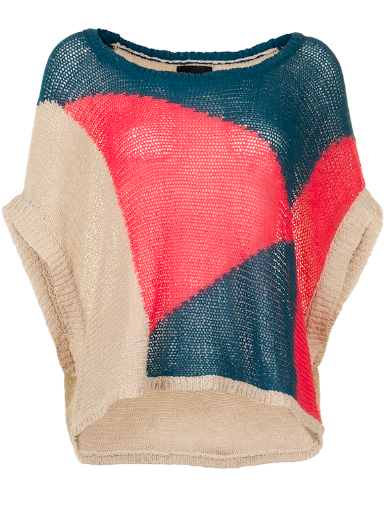 Lucky for you, Line Knitwear is giving away a Quantum Sweater, size extra-small, to one CupidsPulse.com reader! Even at a size extra-small, this sweater is sure to fit many people since it is designed to be over-sized. GIVEAWAY ALERT: To enter for a chance to win a Quantum Sweater by Line Knitwear, go to our Facebook page and click on the “like” button. Then, leave a comment under our Quantum Sweater giveaway post and let us know that you want to enter the contest. We will contact the winner via Facebook when the giveaway is over, and he or she will have three days to respond back with his or her contact information. The deadline to enter is 5:00 p.m. EST on Monday, November 12th. Good luck! Congratulations to Ann Marie Johnson for winning the Quantum Sweater! We hope you love it!